The owner has taken delivery of 55m Picchiotti Ice Class of Galileo G, the second yacht in the Vitruvius® series. The delivery took place at the Picchiotti shipyard in La Spezia in the presence of representatives of the company that owns the yacht and the shipyard’s team. After formalities, Galileo G,’s crew proceeded with the flag changing ceremony. The Picchiotti Galileo G, from the Vitruvius® series has been designed and built according Ice Class classification rules for navigation along the Northwest Passage from the Atlantic to the Pacific Oceans through Canada’s Arctic Archipelago. The third motor yacht in the Picchiotti Vitruvius® series, the 73m MY C.2189, is scheduled to arrive in La Spezia in early 2012. Here it will be finished after initial hull construction is completed at the Perini Istanbul-Yildiz shipyard. 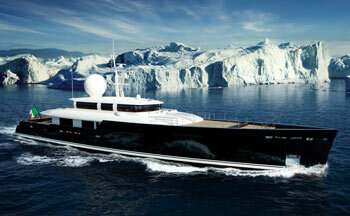 The yacht is scheduled to be consigned in the first half of the year 2013.